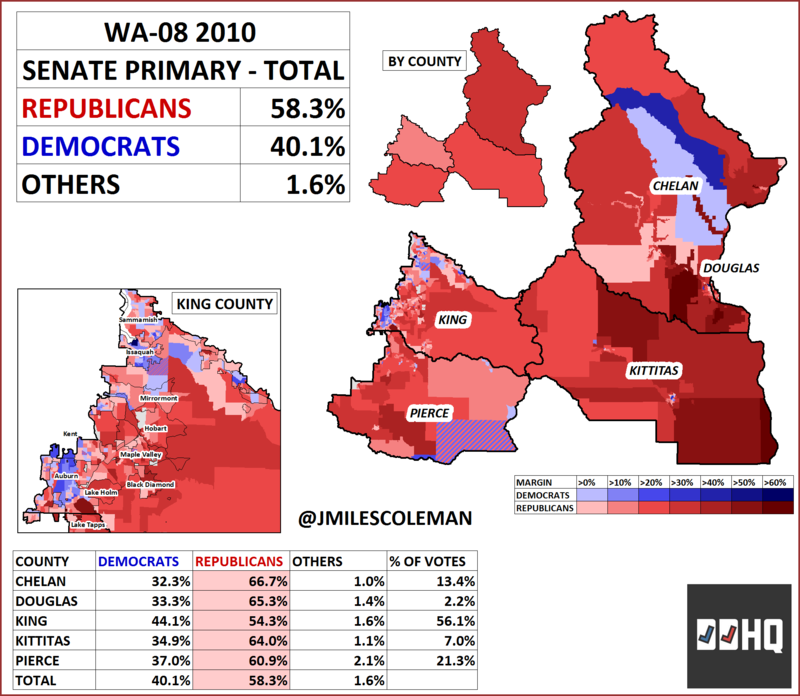 One state that had primaries in August was Washington. The Senate race should be pretty secure for the Democrats, the state will feature a few competitive House races. 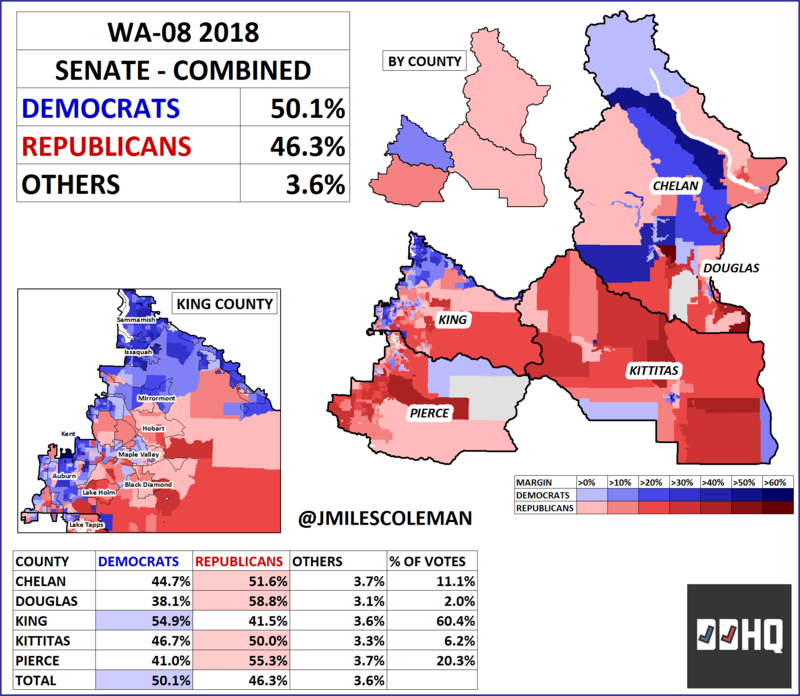 While some Washington Congressional races have popped up on the radar relatively recently – namely WA-03 and WA-05 – both parties have been eyeing WA-08 for about a year. In September, Reichert, after holding the district since 2005, announced his retirement. This was blow to the Republicans chances at retaining the seat; even at that point, it was looking the national political environment would be at least somewhat favorable to Democrats. 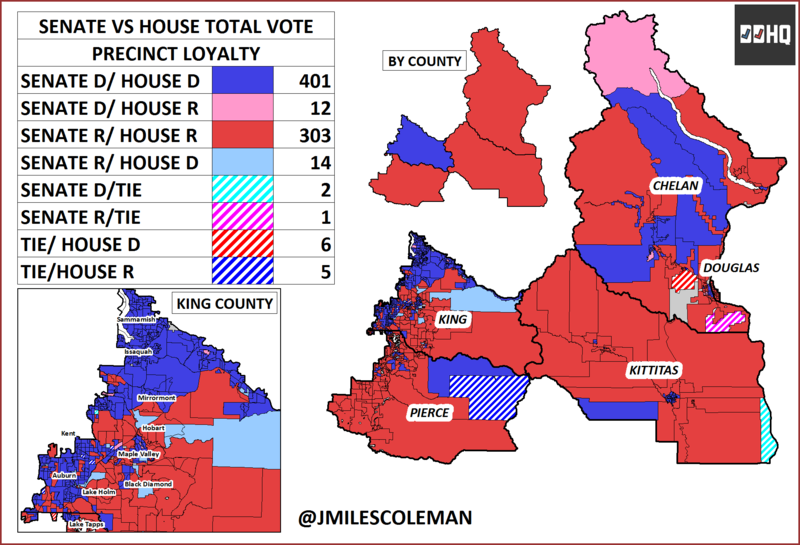 In Washington primaries, all candidates run on the same ballot, regardless of party; the general election in the fall involves the top two candidates. As Rossi was expected to consolidated most of the Republican vote, he was essentially guaranteed a spot on the general election ballot. The second place slot seemed likely to go to one of three Democrats. Kim Schrier, from Sammamish, was a doctor who left her practice to run for Congress; she had support from groups like EMILY’s List. Going to south one city to Issaquah, Jason Rittereiser was an attorney, who was seen as closer to the Sanders wing of the party. Sharon Hader, a former CDC worker from Auburn, was the third possibility. Filtering things further, this map only considers the Democratic candidates. 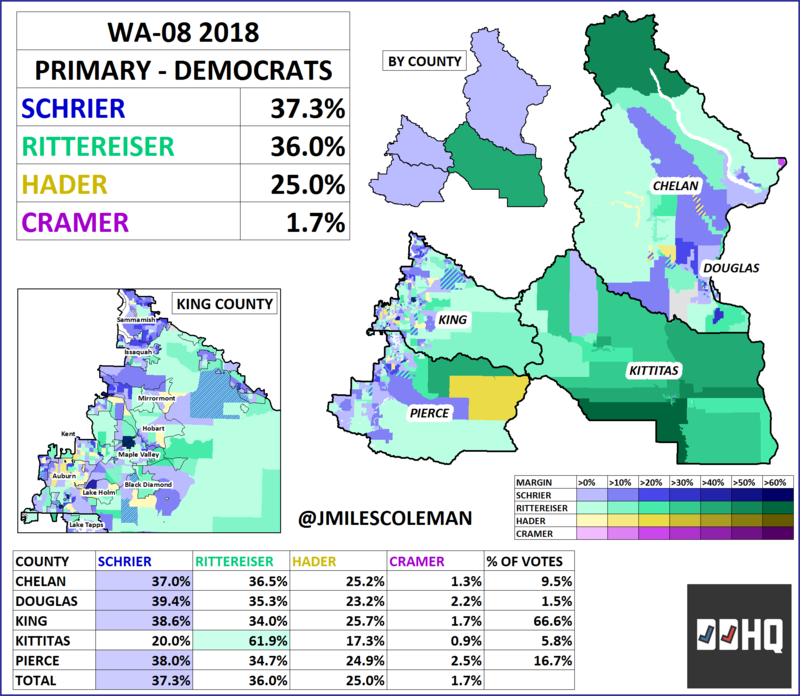 Rittereiser was very strong in Kittitas County, taking 62% there; however, the county is relatively small. 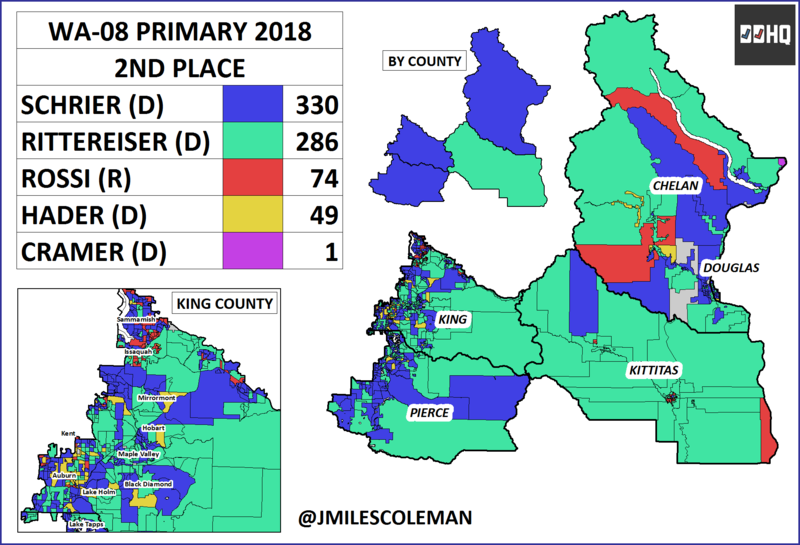 Schrier finished slightly ahead in the other counties, and had the broadest strength. Hader had pockets of strength in some communities, most notably Auburn. A fourth Democrat, Tom Cramer, ran but wasn’t much of a factor. 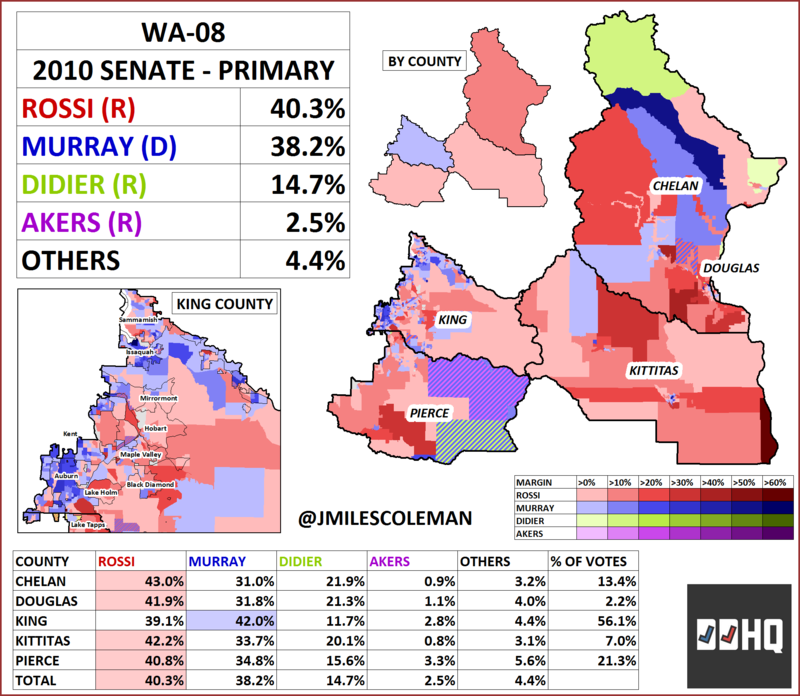 Finally, as Rossi was a candidate in the 2010 Senate race, let’s see what that primary would have looked like in WA-08. 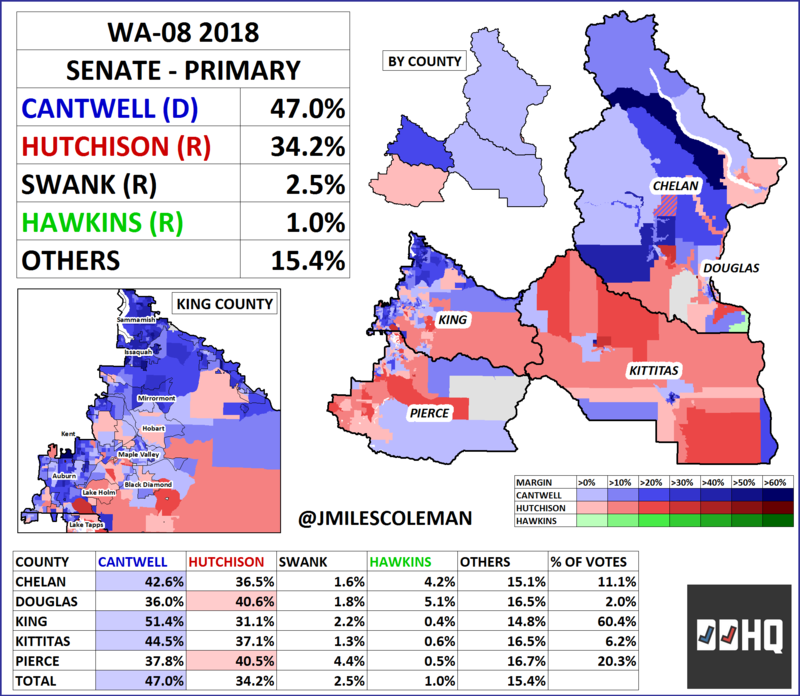 In 2010, he finished with a comparable vote share in WA-08, 40%, but this was 2% ahead of Sen. Patty Murray (D). Looking back, this was impressive, given that 1) Murray was the sole major Democrat in the race and 2) two other semi-serious Republicans pulled an additional 17%. Clint Didier (R) ran as a more stridently conservative alternative to Rossi, and took 14%, while Paul Akers (R) took 2.5%. 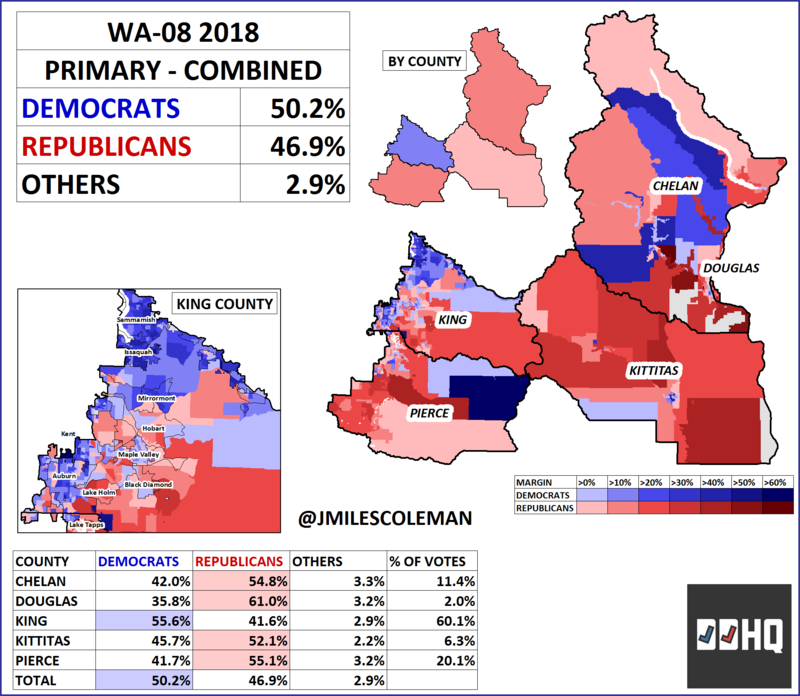 Combining the candidates into their parties, Republican took a solid 58.3% of the vote in WA-08 to just 40.1% for Democrats. Rossi alone got 40.3%, which was more than the entire Democratic field. Republicans cleared 60% of the aggregate vote in all the counties except for King, which was still 10.2% in their favor. 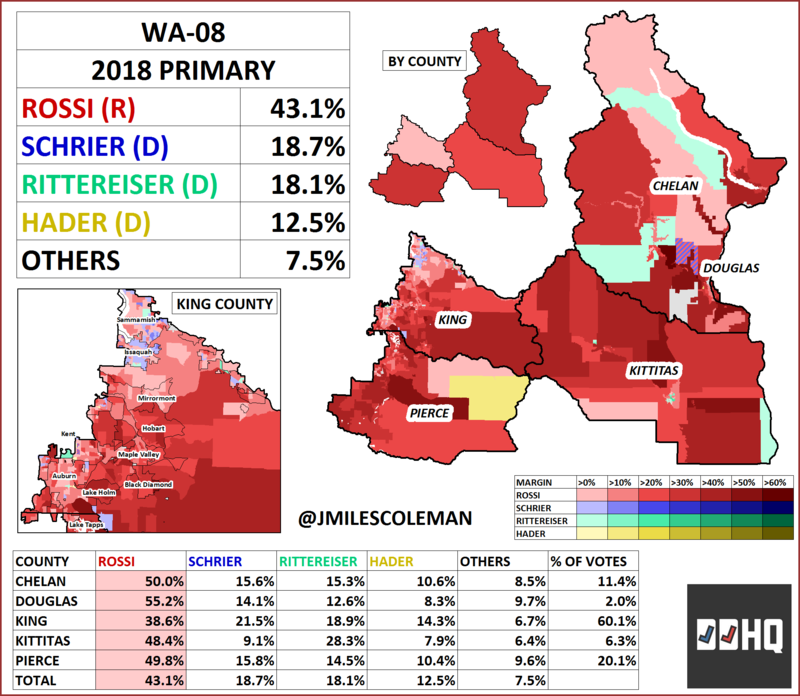 Rossi went on to carry the current WA-08 by 11%. Going forward, this certainly isn’t 2010, but that result does provide some perspective. 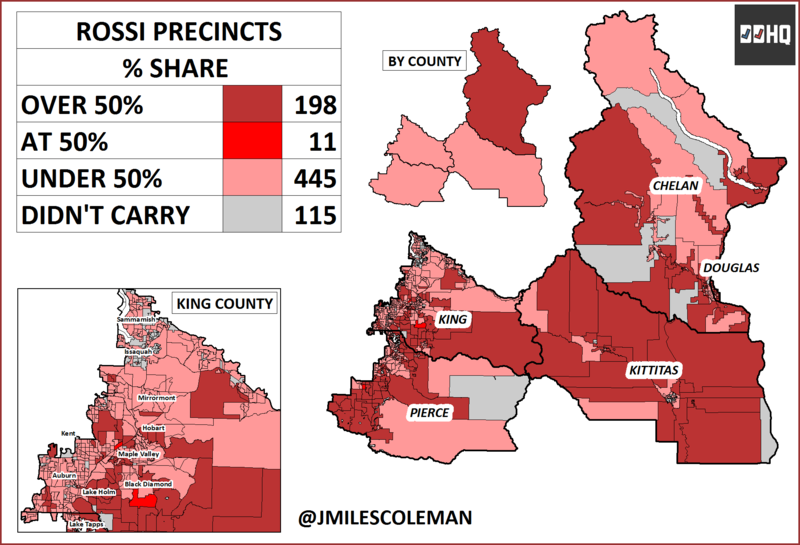 In the November election, Rossi should work to shore up the precincts he won with pluralities in the primary – specifically those in King County. Schrier has the national environment, as well as any Cantwell coattails, on her side. She’ll have to consolidate the Democratic vote outside her base, possibly by reaching out to Rittereiser votes in places like Kittitas County. 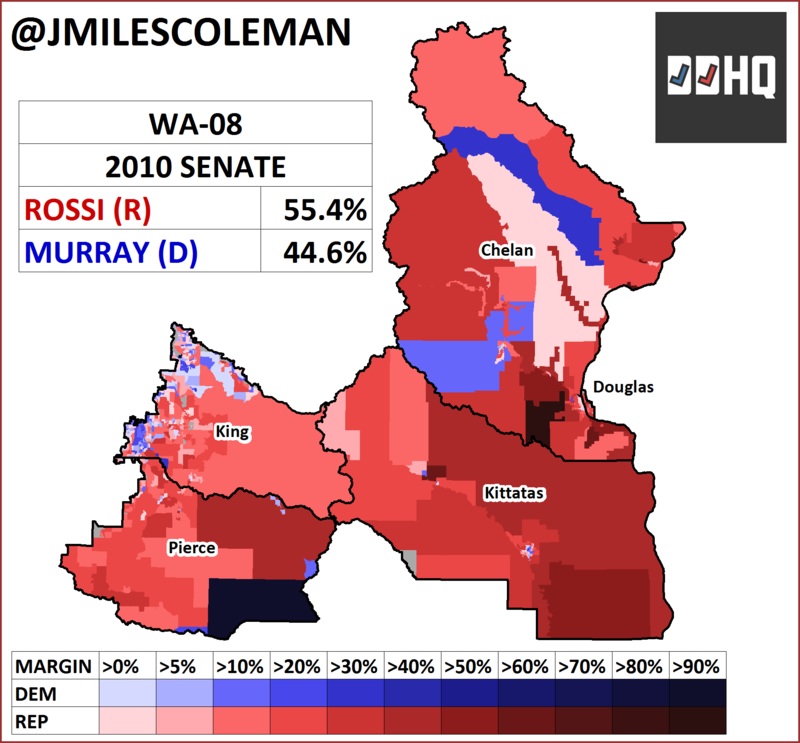 While the President isn’t popular in WA-08, if there’s any Republican that can hold this seat, it’s Rossi.